A reader asked how it was possible for an MPV travelling 15,000 kilometers to generate 4,000 kgs of CO2? If you think of it, its quite amazing that the CO2 generated is almost 3 times the weight of the vehicle! The truth is that when your car burns fuel, the resultant CO2 generated weighs more than the fuel itself. Here's a quick conversion: burning 1 KG of fuel will generate roughly 3.25 kgs of CO2. Did you know that on average, a Boeing 747 can burn about 200 tons of jet fuel per trip? You can try out how much fuel is burnt from flying here. Here's another number: The aviation industry alone, contributes to 2% of the world's carbon emission! Talk about a guilt trip!! Many environmentally conscious Airlines around the world have started to implement a carbon offset program. Cathay Pacific, Qantas, Continental, Virgin are some names who have offered either carbon neutral flights or an option for passengers to participate in their carbon offset programs. 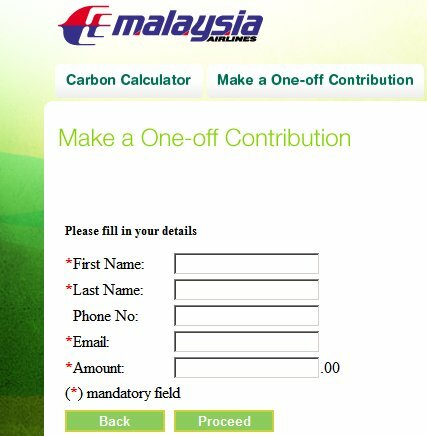 Closer to home, Malaysia Airlines (together with sister companies MASwings and Firefly) have also recently opened its carbon offset program to all its online customers. This is a voluntary program where passengers have the option of contributing a sum of money to help fund selected UN programmes to reduce greenhouse gasses. If you like, you can even make one-off contributions without even needing to travel. Thanks. Yeah, and CO2 is only part of the picture. Other by-products include carbon monoxide (poisonous), nitrogen oxides and sulfer oxides (acid rain), ash and soot, and unburnt fuel.... talk about messing up the air we breath! Hi Jay, so far no news yet from AirAsia. And it is only a matter of time where all other airlines have come up with something -- or be forced to do it by regulatory bodies. oh ya, heard about MAS doing that... which I think is great since we can't help not fly so at least we can contribute back to nature.. happy tree hugging too! This is news to me! Didn't know flying can contribute so much CO2! Good thing airlines are taking note of this. Okay so Symphony is FREE but is it GOOD?